HF: In 1980 there were 1,187 registered watch factories in Hong Kong during a period when it was one of the largest producers and exporters of watches and clocks in the world. The origin of watchmaking here however possibly goes back 170 years and started very soon after the colony was ceded. The article mentions several people and companies involved, mid-19th century, in the business of selling chronometers and watches in HK. Were these actually made here, or as implied in the article in Mr Weiss’ case, in Europe? It seems unlikely that the parts were shipped and then assembled here. Thanks to Richard McGeough for re-typing the article. Carl Smith: The first shopkeeper in Hong Kong with a German sounding name was Charles Weiss – Aberdeen Street – second in the list of foreigners on the China coast published in the Chinese Repository in 1845 gives his nationality as German. In May of the previous year he advertises himself as “Charles Weiss, Chronometer and watchmaker from London and Geneva, Oswald’s Hill opposite Gibb, Livingston and Co.”. This would be in the vicinity of the present Aberdeen Street (Friend of China 24 May 1844). Two months later he moved a bit down hill to the corner of Graham and Wellington Streets (FC 24 July 1844). His brother Alexander A. took charge of the business in 1853 during a temporary absence of Charles (FC 6 July 1853). 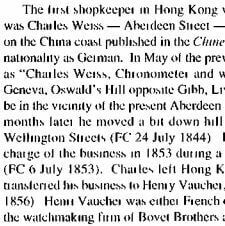 Charles left Hong Kong permanently in 1856 and transferred his business to Henry Vaucher, formerly of Canton (FC 2 June 1856).